حسینی, سیده زینت, سدیدخوی, احمد, غلامی, علی. (1396). کاربرد تبدیل موجک پیوسته در بهینه‌سازی نسبت H/V برای ریزپهنه‌بندی لرزه‌ای منطقه درگهان قشم. 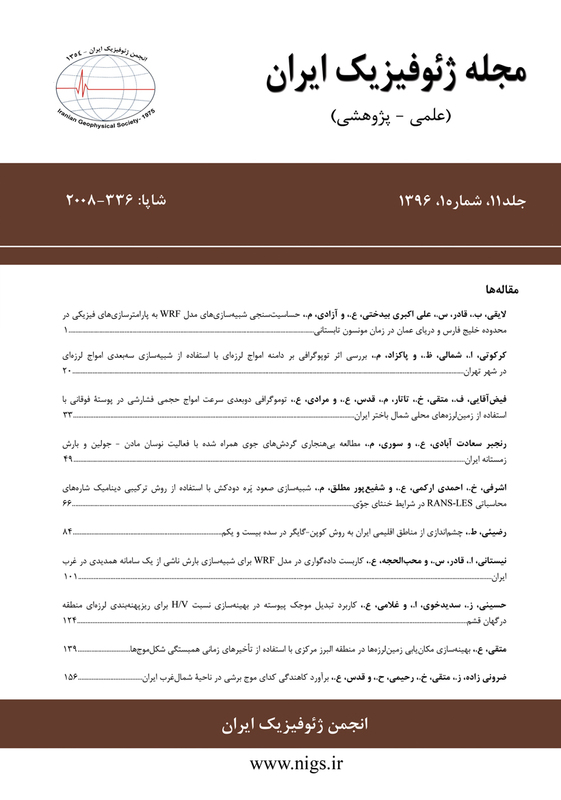 مجله ژئوفیزیک ایران, 11(1), 124-138. سیده زینت حسینی; احمد سدیدخوی; علی غلامی. "کاربرد تبدیل موجک پیوسته در بهینه‌سازی نسبت H/V برای ریزپهنه‌بندی لرزه‌ای منطقه درگهان قشم". مجله ژئوفیزیک ایران, 11, 1, 1396, 124-138. حسینی, سیده زینت, سدیدخوی, احمد, غلامی, علی. (1396). 'کاربرد تبدیل موجک پیوسته در بهینه‌سازی نسبت H/V برای ریزپهنه‌بندی لرزه‌ای منطقه درگهان قشم', مجله ژئوفیزیک ایران, 11(1), pp. 124-138. حسینی, سیده زینت, سدیدخوی, احمد, غلامی, علی. کاربرد تبدیل موجک پیوسته در بهینه‌سازی نسبت H/V برای ریزپهنه‌بندی لرزه‌ای منطقه درگهان قشم. مجله ژئوفیزیک ایران, 1396; 11(1): 124-138. نسبت طیفی بین مؤلفه‌های افقی و قائم (نسبت(H/V ریزلرزه‌ها (میکروترمورها)، که در سطح زمین اندازه‌گیری می‌شود، برای تشخیص بسامد غالب ساختگاه، مورد استفاده قرار می‌گیرد. هدف این مقاله بازیابی اطلاعات موج ریلی برای تشخیص بسامد غالب خاک با دقت بیشتر و پیشنهاد یک ساختار سرعتی برای ایستگاه مورد نظر است. مشکل اصلی در بازیابی منحنی بیضیواری امواج ریلی از نسبتH/V، وجود امواج درونی و لاو در شکل موج ریزلرزه‌هاست. قسمت P-SV شکل موج، تنها در مؤلفه قائم حضور دارد و قسم SH تنها در مؤلفه افقی حرکت سهیم است. اگر اثر SH حذف شود، نسبت H/V، بیضیواری مد اصلی امواج ریلی را بهتر نشان می‌دهد و این امر به دلیل آن است که در نوار بسامدی مورد بررسی، سهم P-SV توسط امواج ریلی احاطه شده است. در این مقاله، هدف، تشخیص موج P-SV در طول سیگنال و ارائه تحلیل زمان-بسامد بر روی هر سه مؤلفه ریزلرزه‌ است. این تحلیل با استفاده از تبدیل موجک پیوسته و استفاده از موجک مورلت اصلاح‌شده صورت گرفته است. ساختگاه مورد نظر، شهر درگهان در جنوب شرقی ایران است. در ابتدا پارامتر مورلت بین 5/0تا 16 تغییر داده شد و بهترین مقدار پارامتر مورلت برابر هشت به دست آمد. سپس نتایج به دست آمده از بسامد غالب با استفاده از این روش، با روش کلاسیک مقایسه شد. مشاهده شدکه بسامد غالب در تمامی ایستگاه­ها بجز ایستگاه M04، M05 و M12 ،که تغییری مشاهده نمی­شود، به سمت بسامد‌های پایین‌تر متمایل می‌شود. در نهایت، منحنی log(H/V)، با منحنی فرضیة بیضیواری مد اصلی موج ریلی به دست آمده از اطلاعات گمانه مقایسه و برای هر ایستگاه، ساختار سرعتی موج برشی برآورد شده است. Neotectonic and Seismotectonic activities have caused major seismicity in Iran. Dargahan city, located in the southeast of Iran, runs a high risk of earthquakes, hence its selection for the research. A large earthquake (Mw = 6.5 28Jun2006) was chosen for the study due to its provision of a suitable geological and velocity structure in this region. To calculate the amplification factor of the soil, it is indispensable to know its elastic properties, especially above the bedrock. One of the best ways to achieve this goal is to implement ambient noise. The spectral ratio between the horizontal and vertical components (H/V ratio) of microtremors measured at the ground surface was employed to estimate the resonance frequency of the site. The purpose of this paper was to retrieve the Rayleigh wave so as to estimate resonance frequency with higher accuracy and offer velocity structure for a single station record. The main problem with the ellipticity curve of Rayleigh wave retrieved from H/V ratio is the existence of the body and love waves in the waveform of the microtremor. The P-SV part of a waveform contribution is only in the vertical component while the SH part is in the horizontal component of the motion. If the SH-part is removed, the H/V ratios better indicate the ellipticity of the fundamental mode of Rayleigh wave, because the interest frequency band of the P-SV is dominated by the fandamental mode. In this paper, the SH removal is done by time-frequency analysis of all three components of the ambient noise. Continuous wavelet transform (CWT) was employed for this task by using the modified Morlet wavelet. The higher the value of the Morlet wavelet parameter (m) is, the narrower the wavelet in the spectral domain, and the better the frequency resolution will be, which leads to more accuracy of the H/V technique. In this article, first-time location of the most energetic time-frequency coefficient of the vertical component was identified and the corresponding local frequency spectrum was obtained. Then, a local horizontal spectrum at the same time location was calculated from an average time-frequency representation of the two horizontal components. Finally, the H/V ratio is calculated by dividing these two local spectra. We selected 12 stations in Dargahan which data (ambient noise) were recorded by CM6TD seismometers over a period of 30 minutes. The frequency-time analysis was done for all three components in the 12 stations. Primarily, Morlet parameter (m) was changed in the range (0.5-16), and the (H/V) curve was subsequently obtained according to this parameter, where the best value for the Morlet parameter was found to be 8. The results obtained for resonance frequency were compared with those of classic methods, showing a shift toward lower frequency in the proposed method. It was also shown that there existed two peaks in the reliable resonance frequency of the M03 station. So as to address the issue, the theoretical ellipticity curve of the Rayleigh wave was obtained from borehole data by the spectral ratio between horizontal and vertical components of its fundamental mode. The theoretical ellipticity curve of the Rayleigh wave and the log (H/V) curve were compared, upon which comparison we found out that the second peak was related to the resonance frequency in site M03. The values of the elliptic curve for near borehole stations which is in good agreement with the H/V curve, are suggested as the shear wave velocity structure for each single stations. By this method, one can estimate the shear wave structure for 8 stations close to the borehole. حق‍شناس، ا.، شفیعی، ع.، عسگری، ف.، مهدی‍فر، م. ر.، جعفری، م. ک.، گریوانی، ه.، تاجیک، و. و رخشنده، م.، 1386، پهنه‍بندی ژئوتکنیک لرزه‍ای و مخاطرات زمین‍شناختی در جزیره قشم: پژوهشگاه بین‍المللی زلزله‍شناسی و مهندسی زلزله، 2268/ع م/85. حق‍شناس، ا.، کمالیان، م.، عسگری، ف.، مهدی‍فر، م. ر.، جعفری، م. ک. و گریوانی، ه.، 1388، ریزپهنه‍بندی ژئوتکنیک لرزه‍ای شهر قشم و درگهان: پژوهشگاه بین‍المللی زلزله‍شناسی و مهندسی زلزله، 2268/ع م/85. Bard, P. Y., 1998, Microtremor measurements: a tool for site effect estimation? : Proc. 2nd Inter. Symp., Effects of Surface Geology on Seismic Motion, Yokohama, Japan, 1251-1279. Bonnefoy-Claudet, S., Cotton, F., and Bard, P. Y., 2006, The nature of noise wave field and its application for site effects studies: Earth-Science Reviews, 79, 205-227. Bonnefoy-Claudet, S., Kohler, A., Cornou, C., Wathelet, M., and Bard, P. Y., 2008, Effects of Love waves on microtremor H/V ratio: Bulletin of the Seismological Society of America, 98, 288-300. Capon, J., 1969, High-resolution frequency-wavenumber spectrum analysis: Proceedings of the IEEE, 57, 1408-1418. Daubechies, I., 1992, Ten lectures on wavelets: SIAM. Fah, D., Kind, F., and Giardini, D., 2001, A theoretical investigation of average H/V ratio: Geophysical Journal International, 145, 535-549. Fah, D., Kind, F., and Giardini, D., 2003, Inversion of local S-wave velocity structures average H/V ratios, and their use for the estimation of site-effects: Journal of Seismology, 7, 449-467. Fah, D., Stamm, G., and Havenith, H. B., 2008, Analysis of threecomponent ambient vibration array measurements: Geophysical Journal International, 172, 199–213. Fah, D., Wathelet, M., Kristekova, M., Havenith, H., Endrun, B., Stamm, G., Poggi, V., Burjanek, J., and Cornou, C., 2009, Using ellipticity information for site characterization: NERIES JRA4 Geotechnical site characterization, task B2-D4, final report. Flandrin, P., 1999, Time-frequency/time-scale analysis: Academic Press. Haghshenas, E., Bard, P. Y., Theodulidis, N. and SESAMEWP04 Team., 2008, Empirical evalution of microtremor H/V spectral ratio: Bulletin of Earthquake Engineering, 6(1), 75-108. Horike, M., 1985, Inversion of phase velocity of long-period microtremors to the S wave velocity structure down to the basement in urbanized area: Journal of Physics of the Earth, 33, 59-96. Kristekova, M., 2006, Time-frequency analysis of seismic signals: Ph. D. thesis, Slovak Academy of Sciences, Bratislava, Slovakia. Lardies, J., and Gouttebroze, S., 2002, Identification of modal parameters using the wavelet transform: International Journal of Mechanical Sciences,. 44, 2263-2283. Nakamura, Y., 1989, A method for dynamic characteristics estimation of subsurface using microtremor on the ground surface: Quarterly Reports. Railway Technical Research Institute, 30, 25-33. Poggi, V., and Fah, D., 2010, Estimating Rayleigh wave particle motion from three-component array analysis of ambient vibrations: Geophysical Journal International, 180(1), 251–267. Poggi, V., Fah, D., Burjanek, J., and Giardini, D., 2012, The use of Rayleigh-wave ellipticity for site-specific hazard assessment and microzonation: application to the city of Lucerne, Switzerland: Geophysical Journal International, 188, 1154-1172. Satoh, T., Kawase, H., Iwata, T., Higaski, S., Sato, T., Irikura, K., and Huang, H. C., 2001, S-wave velocity structure of Taichung basin, Taiwan estimated from array and single-station records of microtremors: Bulletin of the Seismological Society of America, 91, 1267–1282. Scherbaum, F., Hinzen, K. G., and Ohrnberger, M., 2003, Determination of shallow shear wave velocity profiles in the cologne, Germany area using ambient vibration: Geophysical Journal International, 152, 597-612. Yamanaka, H., Takemura, M., Ishida, H., and Niwa, M., 1994, Characteristics of long-period microtremors and their applicability in exploration of deep sedimentary layers: Bulletin of the Seismological Society of America, 84(6), 1831–1841. Yan, B. F., Miyamoto, A., and Brühwiler, E., 2006, Wavelet transform-based modal parameter identification considering uncertainty: Journal of Sound and Vibration, 291, 285-301.